On Thursday March 28, 2019, Mitman Road from Arndt Road to Bushkill Drive will be closed from 9am - 2pm for Road Work. Access to Easton Area School property will be available from Arndt Road. ON THE APPLICATION OF JOSEPH LASSO, 960 COSENZA COURT, (PARCEL NUMBER K-9 145-65-0311) EASTON, PA 18040. PROPERTY IS LOCATED IN THE CR (COUNTRY RESIDENTIAL) ZONING DISTRICT. APPLICANT WISHES TO INSTALL AN IN GROUND SWIMMING POOL THAT EXCEEDS THE MAXIMUM IMPERVIOUS SURFACE RATIO FOR THAT DISTRICT. SECTION 200-15B OF THE FORKS TOWNSHIP CODE ALLOWS MAXIMUM 0.25 IMPERVIOUS COVERAGE PER LOT. APPLICANT PROPOSES TO EXCEED THIS AMOUNT AND IS SEEKING RELIEF FROM THIS SECTION. ALL INTERESTED PERSONS OR THOSE DESIRING TO PROTEST THE GRANTING OF THIS REQUEST MAY ATTEND. Forks Township Trash/Recycling and Bulk Collection for ONLY Monday, March 4, 2019 will start at 10:00 am. Rest of the week is on schedule. Starting next week, Public Works will pickup Christmas Trees on your regular Trash and Recycling pickup day. It will be a separate truck from County Waste. Christmas Trees must be out on your scheduled trash and recycling pickup day, so if your normal day is Monday we will be there Monday and so on. If you put it out on any other day than your scheduled Trash and Recycling day, it will be picked up the following week. If you missed one of the 3 collection days, they can be taken to the recycling center located at 1051 Frost Hollow Road during hours of operation. The Forks Township Planning Commission Workshop Meeting scheduled for Tuesday, December 25, 2018 is cancelled. ON THE APPLICATION OF GREG DENARDO, C/O BI-STATE EQUIPMENT RENTAL CO., 1500 UHLER ROAD, EASTON, PA 18040, TAX PARCEL J9-11-2B. SUBJECT PROPERTY IS LOCATED IN THE EC (EMPLOYMENT CENTER ) ZONING DISTRICT. APPLICANT IS REQUESTING RELIEF FROM SEVERAL SECTIONS OF THE FORKS TOWNSHIP CODE ALL RELATING TO PARKING REQUIREMENTS. SECTION 200-36B3(PARKING SPACE WIDTH), SECTION 200-36B5 (ISLE WIDTH). The Board of Supervisors Meeting, that was canceled due to the snow storm on November 15, 2018 is rescheduled for November 29, 2018. The Board of Supervisors Meeting, scheduled for tonight, Thursday, November 15, 2018 is cancelled. Leaf Collection is postponed Thursday, November 15, 2018. Please check back for Friday. The Forks Township Planning Commission Workshop Meeting scheduled for Tuesday, November 27, 2018, is cancelled. The week of October 29, 2018 to November 2, 2018 on your normal Trash & Recycling collection day. Appliances such as air conditioners, refrigerators and freezers (remove doors; no need to remove Freon), washers, dryers, hot water heaters, dehumidifiers, bicycles, and lawnmowers (oil and gas removed), BBQ grills (gas and/or charcoal removed), and various other household metal items. Starting next week, Public Works will pickup Christmas Trees on your regular Trash and Recycling pickup day. It will be a separate truck from County Waste. Christmas Trees must be out on your scheduled trash and recycling pickup day, so if your normal day is Monday we will be there Monday and so on. If you put it out on any other day than your scheduled Trash and Recycling day, it will be picked up the following week. If you missed one of the 3 collection days, they can be taken to the recycling center located at 1051 Frost Hollow Road during hours of operation. Compostable brown paper bags available at certain grocery stores or online. Tie with cotton or hemp twine in bundles no larger than 3’x3’x3’, and weighing no more than 40 lbs. NO PLASTIC BAGS, OR PLASTIC OR SYNTHETIC ROPE, OR TWINE. NO grass clippings, tree stumps, loose soils, sod, any wood or tree limbs over four (4) inches in diameter; human or animal excrement; noxious weeds or soil contaminated with hazardous substances. ON THE APPLICATION OF DOROTHEA CRYSTAL COOPER CUCCURULTO, 507 HEATHER LANE, EASTON, PA 18040, TAX PARCEL NUMBER K9SE4 1A 3, TO OPERATE A GROUP HOME (PERSONAL CARE) AT THIS ADDRESS. PROPERTY IS LOCATED IN THE CR (COUNTRY RESIDENTIAL) DISTRICT AND A B-16 GROUP HOME IS PERMITTED BY SPECIAL EXCEPTION, SECTION 200-15A3(a). ON THE APPLICATION OF MARK GIBBONS, 936 BETTY LANE, EASTON, PA 18040, TAX PARCEL K9-14-5-59, TO CONSTRUCT AN IN GROUND POOL THAT EXCEEDS THE MAXIMUM IMPERVIOUS COVERAGE ALLOWED. PROPERTY IS LOCATED IN THE CR (COUNTRY RESIDENTIAL) ZONING DISTRICT. MAXIMUM IMPERVIOUS COVERAGE IN THIS DISTRICT IS 25% (SECTION 200-15B OF THE FORKS TOWNSHIP CODE). APPLICANT IS PROPOSING 33% AND IS SEEKING RELIEF FROM THIS PROVISION. The Forks Township Planning Commission Meeting scheduled for Thursday, August 9, 2018, is cancelled. Also, the Planning Commission Workshop Meeting scheduled for Tuesday, August 28, 2018, is cancelled. The BOS meeting for Thursday, August 2nd has been canceled. ON THE APPLICATION OF DAVE & DAWN ARCURY, 302 RAMBLEWOOD DRIVE, EASTON, PA 18040, TAX PARCEL K9-16-65, TO CONSTRUCT AN IN GROUND SWIMMING POOL THAT EXCEEDS THE MAXIMUM IMPERVIOUS COVERAGE. PROPERTY IS LOCATED IN THE CR (COUNTRY RESIDENTIAL) ZONING DISTRICT. MAXIMUM IMPERVIOUS COVERAGE IN THIS ZONING DISTRICT IS 25%, SECTION 200-15B OF THE FORKS TOWNSHIP CODE. APPLICANT WISHES TO INSTALL A POOL THAT COVERS 31.3% OF THE LOT. APPLICANT IS SEEKING RELIEF FROM THIS PROVISION BY REQUESTING A VARIANCE. Starting on Monday July 9, 2018, Easton Suburban Water Authority will be installing a new water line on Arndt Road from Indian Trail to Mittman Road. The project is expected to take 4-6 weeks depending on the weather. There will be daytime Road Closures with posted detours in effect during construction. The BOS meeting for Thursday, July 5th has been canceled. Section 2404. Use of consumer fireworks. (a)	Conditions.-A person who is at least 18 years of age and meets the requirements of this article may purchase, possess and use consumer fireworks. Consumer fireworks or sparkling devices within, or throw consumer fireworks or sparkling devices from, a motor vehicle or building. Consumer fireworks within 150 feet of an occupied structure**. ** "Occupied structure" A structure, vehicle or place adapted for overnight accommodation of persons or for conducting business whether or not a person is actually present. A person selling consumer fireworks in violation of the provisions of this act commits a misdemeanor of the second degree. A person selling display fireworks in violation of the provisions of this act commits a felony of the third degree. A person selling federally illegal explosives such as devices as described in 49 CFR 173.54 (relating to forbidden explosives) or those devices that have not been tested, approved and labeled by the United States Department of Transportation, including, but not limited to, those devices commonly referred to as "M-80", "M-100", "blockbuster", "cherry bomb" or "quarter or half stick" explosive devices, in violation of the provisions of this act commits a felony of the third degree. The Planning Commission Workshop Meeting scheduled for Tuesday, June 26, 2018, is cancelled. Each residence can put out two (2) bulk items on their regularly scheduled collection day during these weeks. Bulk items include items too large to fit into the waste cart and are further defined as items having the approximate size and weight of a standard size sofa that can be carried by two (2) men. Examples include furniture, mattresses, rolled up and tied rugs no larger than 3’x6’. Unacceptable materials that will not be collected include construction materials, hazardous waste, electronics, tires, yard waste, grass clippings or additional household trash. The Forks Township Board of Supervisors meeting has been canceled for May 3, 2018. 2.Compostable brown paper bags available at certain grocery stores or online. 3.Tie with cotton or hemp twine in bundles no larger than 3’x3’x3’, and weighing no more than 40 lbs. 5.NO grass clippings, tree stumps, loose soils, sod, any wood or tree limbs over four (4) inches in diameter; human or animal excrement; noxious weeds or soil contaminated with hazardous substances. The Forks Township municipal building will be closed on Friday, March 30, 2018. ON THE APPLICATION OF MILAGROS RIOS, 1213 SYCAMORE AVE. EASTON PA 18040, TAX ID# K9SW2-3-11, TO OPERATE A H-2 GENERAL HOME OCCUPATION IN A RESIDENTIAL ZONING DISTRICT. HOME IS LOCATED IN THE CR (COUNTRY RESIDENTIAL) ZONING DISTRICT. SECTION 200-15A3(D) OF THE FORKS TOWNSHIP CODE ALLOWS THE USE BY SPECIAL EXCEPTION. APPLICANT WISHES TO OPERATE A BEAUTY SALON IN HER HOME. Garbage and Recycling Collection for Wednesday, March 21 has been canceled due to the weather. Wednesday will be Thursday, Thursday will be Friday, and Friday will be Saturday. Any questions please email skramer@forkstownship.org. Forks Township has begun the implementation portion of the Nixle Notification System. 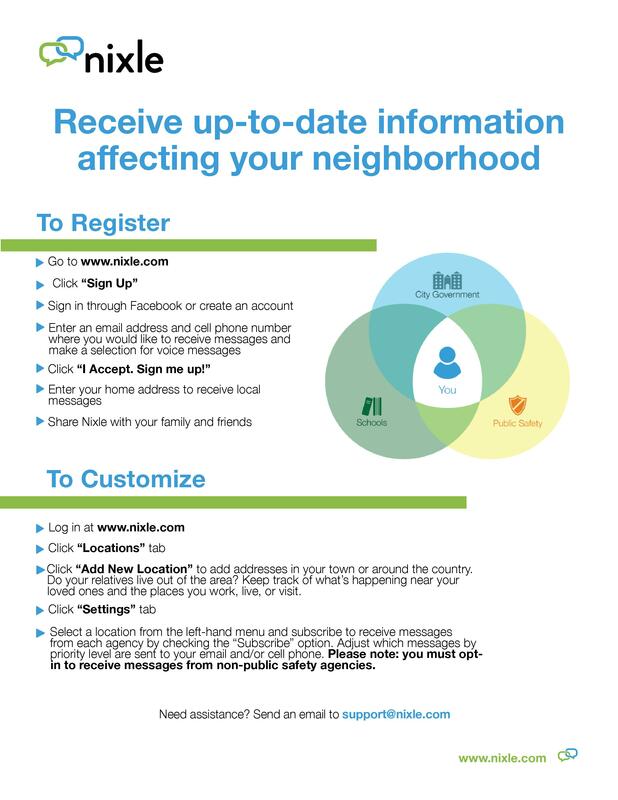 Please register if you are interested in being notified of situations occurring within the township borders. We are looking to have the system live within the next week or two. Click HERE for more information. Any questions please email skramer@forkstownship.org. On February 8, 2018, the Winter Olympics in PyeongChang, South Korea, began and the world’s attention is on this magnificent sporting event. As the games get underway, criminals will likely capitalize on the high-profile occasion by utilizing various techniques to steal cash and personal information from victims. Criminals may use the stolen personal information to create fraudulent accounts to conduct further illegal activity. Listed below are some of the Olympics-related scams: Click HERE for more information. The Planning Commission Workshop meeting scheduled for Tuesday, February 27, 2018 is cancelled. Garbage and Recycling Collection for Wednesday, February 7 has been canceled due to the weather. Wednesday will be Thursday, Thursday will be Friday, and Friday will be Saturday. The Recreation Board Meeting is scheduled for January 22, 2018 at 6:00pm at the Forks Township Community Center. Garbage and Recycling has been canceled due to the weather. Collections will resume on the holiday schedule. The Recreation Board Meeting is canceled on January 15, 2018. A furture date will be advertised to make this meeting up. The Forks Township Board of Supervisors will hold a meeting on 12/26/2017 at noon in the municipal building. The 2018 Budget approval will be the primary topic. Public Works Department will collect Christmas Trees the week of January 8, 2018 to January 12, 2018 by scheduled pick up only (NO EXCEPTIONS). You will have to call 610-438-2670 to arrange the pickup for that week. The Forks Township Planning Commission Workshop Meeting for December 26, 2017 has been cancelled. The week of December 25, 2017 and January 1, 2018 will be moved back by 1 day. If you have any cardboard or wrapping paper that needs to be discarded, it can be taken to the Recycling Facility at 1051 Frost Hollow Road and placed in the green container during normal operating hours listed below. Christmas Trees can be dropped off at either the Recycling Facility (Preferred) 1051 Frost Hollow Road or the designated at the Municipal Building during operating hours listed below. Crews have completed the runs through the Township for 2018. There will be a roaming crew throughout the Township until next Friday December 15, 2017. If you require a leaf pickup please call 610-438-2670 and we will schedule the crew. Crews will have completed collection of the Township 7 times by the end of this week, so next week will be the last collection for 2017 as we need to prepare the equipment for winter operations. Please pass along to any other residents. Forks Township offers the residents a leaf collection service. We will get around to everyone, so we ask for your patience during the process, as there could be a reason (Equipment Breakdown or Township Emergency) for a delay getting to your location. Residents are asked to either pile or windrow their leaves along the curb line or edge of the street. It is important that only leaves are put out for collection as we use machines that run on vacuum. Make sure there are no branches, rocks, or debris in the piles. If we see this type of foreign material in the pile, we will not pick it up. Objects, such as branches or shrubbery, will cause the suction tube to clog and in some cases may reach the machine's impeller and may result in expensive repairs and down time. These items should be taken to the Yard Waste Facility located at 1051 Frost Hollow Road during the hours of operation. If there is an inlet/catch basin in front of your house please try to keep the top of the grate free of debris. At this time one machine is sent out once a week covering a specific route that takes it through the entire Township. This route will then be repeated weekly until the volume of leaves increases and a second machine is added and the Township is then divided in half with Sullivan Trail being the dividing line. Collection will continue until the first week of December, and then trucks are fitted with snow removal equipment. Note: Any "bagged" leaves will not be picked up. 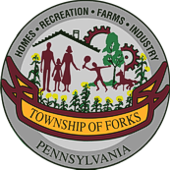 The Forks Township Board of Supervisors is seeking letters of interest for two vacancies on the Forks Township Recreation Board. Interested residents may send a letter of interest c/o John V. Cornell Township Manager at Forks Township 1606 Sullivan Trail, Easton Pa 18040-8398. Letters of interest may be received until 3:00 pm Friday November 3, 2017. Following receipt of letters of interest, public interviews will be held the evening of November 16, 2017. A detailed description of the mission and responsibilities of the 7 member Recreation Board may be found on the Forks Township website at www.forkstownship.org. Forks Township is an equal opportunity governmental organization and does not discriminate on the basis of race, creed, religion, or gender. Any questions may be directed to the Township Manager at 610-250-2251. The new fully automated curbside waste and recycling collection program begins September 1, 2017. For more information on the program, please click here. The Forks Township Board of Supervisors invites you to explore your Forks Township website. We want to provide our web visitors with the latest information on township governance, services, public meetings and events, along with staff contacts. We continually treat the website as a work in progress to assure the best service and information to our residents and visitors. The Board's mission is to support the best quality of life for our residents by maintaining a professional and responsive staff; delivering the highest level of public safety; providing recreation to promote wellness for all ages through our Community Center programs; encouraging the utilization of the Township's well maintained parkland and its facilities, including the extensive network of recreational pathways; and finally to deliver governmental services in a courteous, efficient and fiscally responsible manner. We hope you experience perusing our website is both positive and informative. We would enjoy hearing from you. Please contact us with your comments and suggestions.